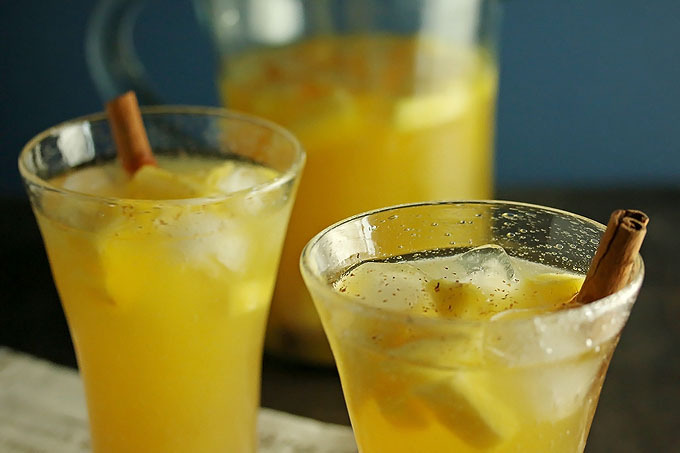 Pineapple sangria is the perfect fall sangria made with the warm spices ginger, cinnamon and nutmeg. Unique and unexpectedly delicious. 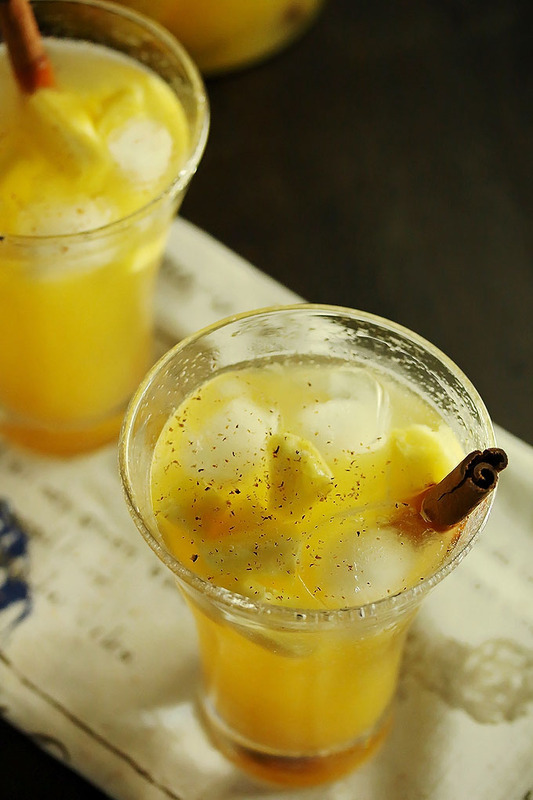 This pineapple sangria is obviously very pineapply but the flavor of the winter holiday spices shines brightly through. At first, I will admit that I wasn’t sure if I would like it. We have definitely tried a number of flavor combinations throughout the life of this blog and when we cheers and take our first sips, we look at each other and we know… Sometimes we fail epically, some are good, and others are a smashing success. 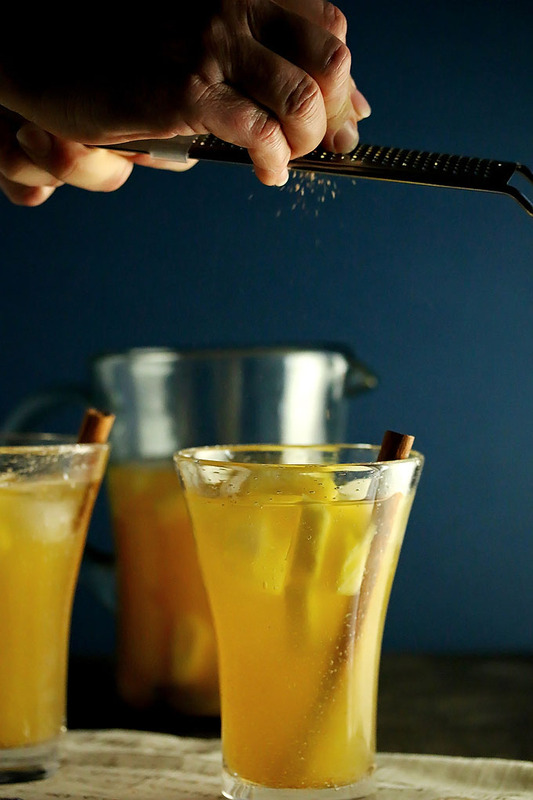 This fall sangria is most definitely in the smashing success category. The only problem with these is that they are so delicious that they are quite easy to drink fast so you have to make lots! Good thing you can make a pitcher at a time quite easily. 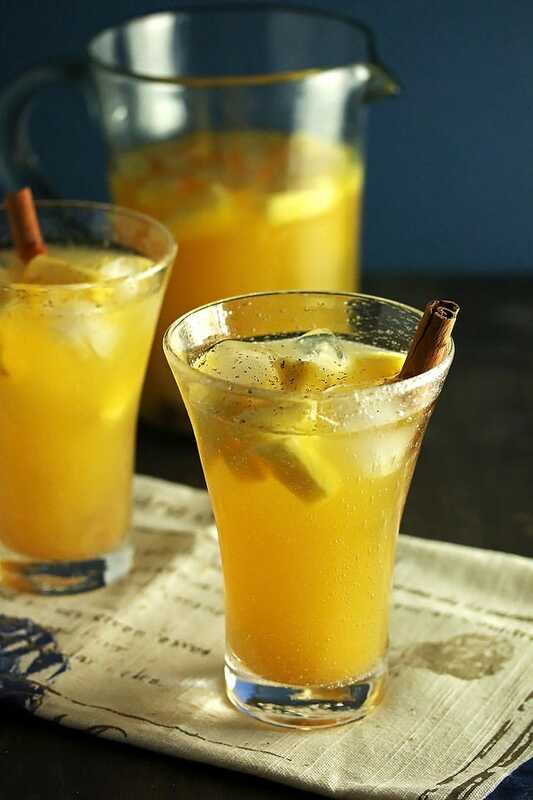 We loved this pineapple fall sangria when we drank it straight away, but we also had some after it chilled in the fridge overnight and it was even better then! So if you can, make it ahead of time. Heat the pineapple juice and spices in a medium pot until it begins to boil, reduce the heat to the lowest setting, cover and let it sit for 30 mins. Then turn the heat off completely and let the juice come to room temperature. To make the sangria, mix the pineapple juice, pineapple vodka, white wine, and pineapple in a pitcher. Let the mixture chill in the fridge. 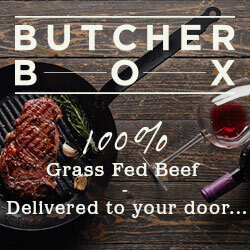 Yum, this looks so good- I definitely have to try it! 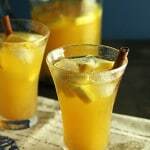 As the holidays get closer, i’ve been collecting all kinds of mixed drink recipes for our holiday get togethers; this is going on the list, along with these: http://spoiledtoperfection.com/blog/blog/2016/10/24/sparkling-wine-cocktails-for-the-holidays/ thank you for sharing such a yummy cocktail! Thanks Rhianon, hope you enjoy it! I for real want this right now!! I’m obsessed with pineapple and this monkey bread is EVERYTHING! Love it, Julie & Debbie! !